In the foothills of the oldest mountains in the world lies time and space for connection. Our module-based 300hr yoga teacher training program allows you to advance your teachings when it suits you, beginning with the first step: Explore. This springtime intensive is designed to give you a wide range of tangible tools that can be incorporated into your teaching right away. Alongside advanced yogic wisdom, you will receive the opportunity to dive deep into your personal practice of meditation, pranayama and bhakti as well as creative, holistic asana. As summer begins to blossom in the mountains, rivers, and forests, it is a perfect time to deepen your knowledge and reveal the wisdom to follow your passion and your purpose. In addition to the core curriculum of yoga philosophy, energetic principles, and yoga asana (alignment, anatomy, and teaching), we will explore spiritual traditions from the South American Andean Quechua, Central American Mayan, and North American Cherokee and Lakota traditions. To connect with the land surrounding Seven Springs, we will collaborate with local healers from the Cherokee nation and traditional Appalachian naturopathy for offerings that include a traditional sweat lodge ceremony. The sacred stillness of this ancient mountain range is a deeply nurturing place to become aware of the divine reflection within yourself. 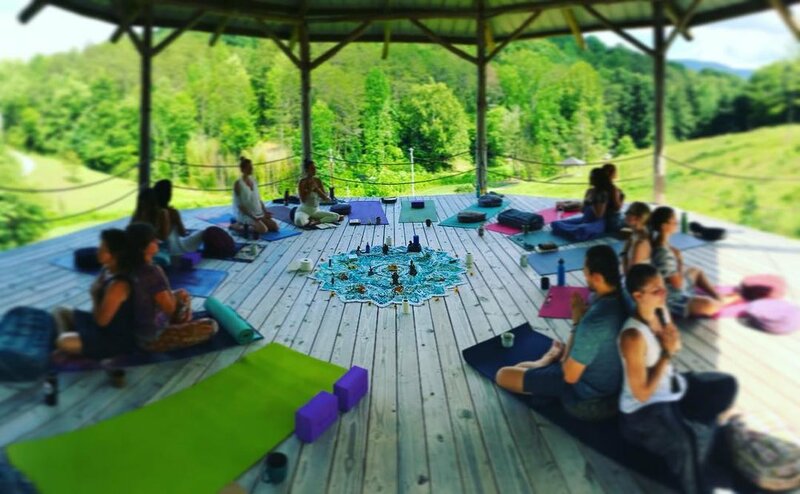 Seven Springs is a holistic retreat center, nestled in the bio-diverse foothills of the smoky mountains of Tennessee on 126 acres of mostly forested hills. With seven natural springs and an abundance of native species, the natural vibrancy of this land is complemented by the integration of offerings with wisdom and teachers from the local Cherokee traditions. Seven Springs is named after the abundance of fresh water on this land, with a spring dedicated to each chakra, giving potency to the fresh water that flows from within the earth. Cleansing in this water is a powerful experience that reaches far beyond just the physical body. Standing 16 feet tall and 28 foot diameter, the Seven Springs yoga shala is open to the fresh mountain air, supported by mighty cedars, sustainably felled in the surrounding forest. On a hill near to the shala sits the open-air massage pavilion. Ceremony is held under the stars around our special fire circle. Seven Springs has five residential yurts on site, each fully furnished with beds, tables, electrical outlets and dressers. If you've never slept in round walls this is a must-try! There are also several ideal camping spots along the creek, near to the luxurious community kitchen and bathrooms with flush toilets and hot showers. Food is prepared and eaten without walls. The classroom space is in a 24ft octagonal retrofitted & recycled yurt -- the perfect place to practice and learn. A labyrinth lotus lovingly painted on the floor invites walking meditation and a well-stocked library invites cozy study. When nature calls wander down the hollow where you’ll find our 35ft traditional 7 course labyrinth nestled under an ancient elm within a natural bowl - a perfect place for contemplation and visioning. Seven Springs Holistic Retreats is a place of natural abundance and cultural diversity where people learn how to create holistic sustenance for themselves and their communities. To provide an innovative and transformative space for local and global communities to experience high quality holistic education. Enjoy glimpses of the first light of sunrise in the open-air yoga pavilion with a breathtaking view of the Chillhowee mountains. Enjoy nightly gathering and special ceremonies around the power of the fire. Relax in our open-air massage pavilion with a massage by one of our resident therapists. Enjoy a sacred cleansing with pure mountain spring water that originates on the property. Explore this fascinating region before or after the course, with attractions such as the Great Smoky Mountains National Park, the most visited National Park in the U.S.! Since a young age, jessi has studied dance and creative movement. Since her first RYT200 teacher training in 2008, jessi has led retreats and workshops throughout the states, Guatemala, Mexico, Peru, Bali, and Costa Rica. She completed her RYT500 certification in 2012 and now leads teacher trainings in places she most enjoys to share. Jessi teaches a Vinyasa based practice to combine elements of dance and natural movement with traditional yogic sequencing. She incorporates attention to rhythm of the breath, and allows for organic movement to flow in each pose. She is grateful for the journey of yogic creativity and loves to share this movement of bliss with others along the way. For half of the year, Jessi lives and teaches in Guatemala. Six years ago, she founded JUSTA, a holistic network that connects indigenous artisans, global designers, and projects that promote self-sustaining development, creative expression, and holistic empowerment within family and community. Learn more about JUSTA here. Zachary Towne-Smith (RYT 500hr) is a passionate connector. His innate creativity, flexible perspective, and quick smile make him a natural leader, inspiring participation and thoughtful consensus in the wide array of groups he works with. He has dedicated his life to the study and development of intercultural relations and the facilitation of innovative solutions for sustainable well-being. He expresses his own creativity through music, photography, and capoeira bringing insights from these arts into his facilitation and mediation. In 2006 he co-founded the Guatemalan non-profit Imagitlán. Together with this multi-disciplinary group he led the development of the Holistic Action Planning for Innovation (HAPI) methodology and has implemented it in many diverse contexts ranging from economic to cultural development, resulting in stakeholder-owned solutions to shared challenges. He believes that interpersonal relationships and creativity are the keys to sustainable innovation, and brings a unique skill set to his work with individuals and groups in settings ranging from corporate board rooms to dirt-floored rural schools. His multi-cultural and multi-lingual fluency are valuable assets as groups develop and maintain creative environments of respect and trust. Watch his TedX talk here.